Hump Day Hook Up has no rules, other than to link up an older post. And by older, we mean something old enough to ‘date’… Not today’s fresh shiny new post. It’s a chance to dig up something from your archives you want to pimp out again and have it read one more time. Let’s face it, it was so good you wanted more people to read it anyhow…. AND comment. As always there’s No themes and no rules… It’s like the easiest hook up you’ve ever had! Hop on over, everyone loves a hook up. 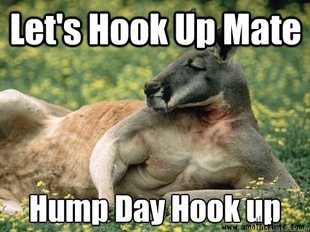 Make sure to come back each Hump Day Wednesday. Hook Up starts at 8am, cocktails optional, no judgement. Under “Link Title”, enter the title of your blog, not your post. Under “URL”, enter the address for that specific post, not your home page. Please share on facebook and twitter. The more friends we hook up with the more hook ups we get…. Wait, is that wrong? More is better right? Oh and don’t forget to PIN IT! Hump Day Hookup! Woo hoo! Better late than never! Thanks for hosting! I’ve got my boots on and I’m all hooked up. Where’s my gold star? Oh boy, I never get a chance to read all the fab blogs that are posted but this week I’m gonna try to get through as many as I can. Here goes, bin the work day! This is very cool! Thanks for doing this.